California native Shane Dwight has built a solid reputation as a “Guitar Slinger” since his relocation to Nashville three years ago. The young guitarist has performed greater than 2,000 live shows, headlined music festivals around the globe, performed with countless big names in all genres of music (B.B. King, Los Lobos, Los Lonely Boys, Night Ranger, Johnny Winter, Jimmie Vaughan, and others), and has released seven albums during a 10-year span. The move to Nashville, however, brought mixed results. On the good side, he signed with a record label, found a major booking agency, and connected with many of the world’s best musicians, producers, and managers. The down side of events was the end of his marriage. 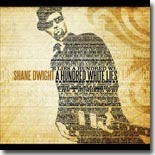 During that tumultuous time, Dwight began writing songs for his latest release, A Hundred White Lies (R-Tist Records). The result is Dwight’s most personal album, with 11 of the 12 tracks coming from Dwight’s pen. The title track, about cheating, and how one lie quickly leads to another, and another, and another ….. “She Struts 22” discusses the temptations that musicians face when on the road, and “Love’s Last Letter” has a relentless tempo that belies the painful lyrics. The poignant “True Love’s Gone,” which sounds as much like contemporary country hit as you’ll find, serves as a summation of Dwight’s emotions. Most of the other tracks continue along this vein, including “Black Ice,” about a good deed that leads to trouble, “Broken,” about dealing with separation, “Lose That Number,” about cutting the ties that bind. “Love That’s True,” the purest blues song on the disc, features Dwight on slide guitar, with stellar vocal backing from the McCrary Sisters. “I’m Talkin’ To You” comes in second on the blues scale, sounding like a rocked-out Chicago Blues track. The closer, “Leave The Light On,” really rocks the house. The album’s lone cover is a faithful rendition of Bob Dylan’s “Wagon Wheel” that fits pretty close to the vibe of the disc. A Hundred White Lies was produced by Kevin McKendree, who also plays keyboards and acoustic guitar. The rest of the band, like McKendree, consists of members of Delbert McClinton’s band, including Rob McNelley (guitars), Lynn Williams (drums), and Stephen Mackey (bass). Nashville blues cat Mike Henderson adds harmonica on several tracks and Bekka Bramlett’s background vocals are a major factor on several cuts. There’s no question that sometimes the best songs come from the worst times. Shane Dwight’s darkest period has resulted in possibly his best release to date. Mixing heartfelt songwriting and potent blues and rock rhythms with the sounds of Nashville has proven to be a winning combination with this release. Don’t miss this one.